On Monday I had the opportunity for some continuing education for my home inspection career. My in-laws were having their water heater replaced with an on-demand water heater, very cool! Besides learning about these appliances since I don’t run into them that much, I also had a captive audience (much to his dismay I’m sure, but thanks for putting up with me Woody) of a plumber to ask the questions which keep me up at night pondering. One of these questions, and the answer, is the topic of this short post. In an effort to be less verbose for once, my question was about the insulating blanket that people, myself included, wrap around our water heaters in an attempt to improve the energy efficiency of said water heater. Without beating around the proverbial bush let’s just say he politely laughed at me and said that those blankets help keep him in business (I didn’t tell him I had one on my water heater, btw!). I did know that the water heaters are already insulated between the outer skin and the inner tank liner and I guess if it was losing heat you would feel it on the outer skin come to think of it!? So, not only is it a waste of money to buy the blanket and a waste of time to install it but it also apparently the blanket helps to trap any possible moisture or condensation from the cold tank and warm and humid summer air between the insulation and the outer tank. This will cause your water heater to corrode ahead of its time. Who knew!?!?!?!? Not me. I had actually heard that it wasn’t necessary to insulate but not that it was possibly actually harmful. Great label and a good IPA. Never had it. Now, much to Jul's consternation, I can add the bottle to my collection. Well, that’s it. Short and sweet before the holidays. 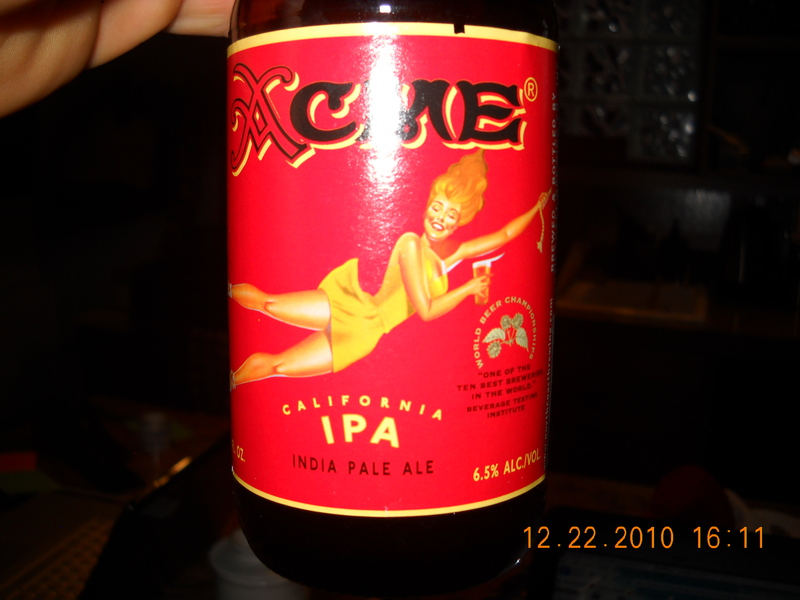 I’m raising a holiday beer for you right now (Got an Acme California IPA from Andersons today. Good beer and great label for my collection) and hoping you have a great one! Thanks for this information, but I’m feeling a bit let down. At first, I got very excited reading as I thought the IPA bottle was a new type of beer bottle water heater wrap. You know, like those grill covers that look like your favorite football teams helment. I was all ready to wrap my water heater tank in some Bell’s Expidition Ale. That news would have made this post super awesome. LOL!! Like a Fathead for your water heater only beer labels instead of sports figures. What a great idea! I’m a fan of the Bell’s Oberon.